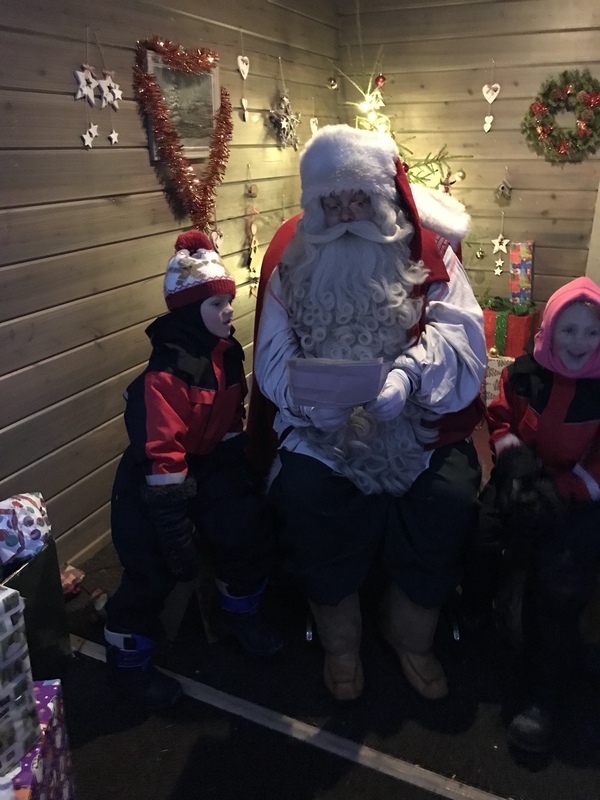 I guess the whole point of going to Lapland is to see the big man! Santa’s Lapland do the whole santa experience perfectly. At the beginning of November they send out the paper for the children to write their letters to santa on. You can ‘post’ them anyway that you like but you need to take them with you on the artic circle day to hand over to the elves. We put ours in an envelope my mum had made and our elves took it back to Santa. We chose to go to the Santa sleigh ride first so there was quite a long queue. We put my mum into the queue and in the mean time did a couple of other activities. I very much doubt anyone has caught a fish on this pond but the kids found it fun trying. Ice hockey was all Xavier had gone on about since he had heard me mention it months ago. There were lots of older children and adults doing it but it didn’t stop them joining in. My mum probably waited about half an hour and it was cold standing around. The rangers get you singing songs with lots of actions to keep warm and there is a warming tent near by where you can pop for a hot berry juice. When you are close to the front of the queue the kids are distracted by one ranger whilst another asks for your “magical tickets” these are the letters the children have written to Santa. A snowmobile then pulls up to take you on your search. You have a 5 minute journey going through the woods until you see some elves. They stop you and take you to a small hut. When you go in Santa is there and he tells the children who they are…they were amazed. He sits them next to him and pulls out the letters they sent him from his pocket. It’s this moment that makes the trip worth every penny. They can’t believe sant knows them and knows exactly what they want. He struggled a bit with Lottie’s because her handwriting is hard to read. I wrote Romeo and Xavier’s for them and he was much better with this. He pulled it back though by saying he would review it later! You can take photos the whole time, I did a few videos too and then the elves will take group photos for you on your camera. There is no professional photos but it means no extra charges. The elves also take some “elfies”! Santa gives the children all a gift…they all have the same. They ask you in advance not to try and get Santa to give the children a present they have asked for as they want the experience to be the same for everyone. The elves then take you back outside and you have another ride back on the sledge. Before the trip the children had started to question whether they had seen the “real” Santa at events we had been to. Romeo came out and said “that was definitely him!” Don’t know what I’m going to do next year. But even when they might question that other Santa’s are not real, I think I can keep them believing that there is one real one out there.